Wine and Design on Wednesday January 2nd for an open studio where you can choose any design you would like to paint. This event is BYOB. To book this class click here! The Carolina Hurricanes are playing the Columbus Blue Jackets on January 4th at PNC Arena. The Hockey game starts at 7:30 pm. To buy tickets and view the rest of the Hurricanes schedule click here. Spring Haven Farm is hosting goat yoga January 5th and 6th at 10:00 am in their new indoor goat yoga studio. 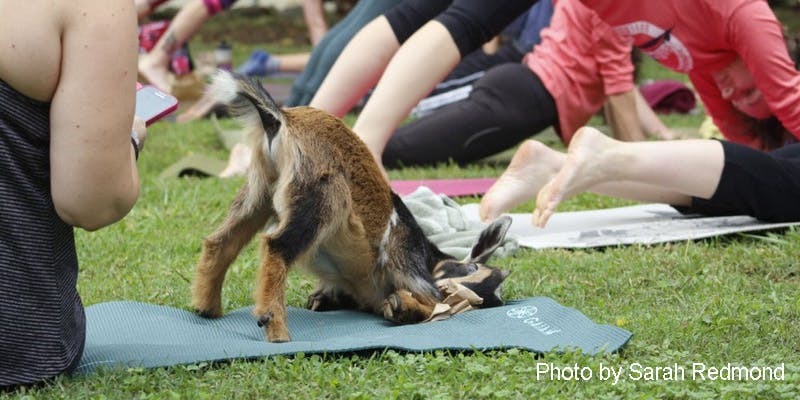 You will also be able to pet and feed the goats while doing yoga! Buy tickets here! Every Saturday Taste Carolina Gourmet Food Tours take place from 1:30-3:00 pm. Walk the streets of Downtown Durham while tasting food and drinks from different restaurants of the area. You can even arrange a group or private tour. Find out more information here. Special Blessings is hosting their Family Fun Day: New Year's Party on January 5th at 1:30 pm. There will be light refreshments, music, and fun and games for every one. For more information click here!